It’s my first post in 2019 and I’m so glad to be back! I’ve been busy with our family’s move from the South to the North. We now reside in New York, which I’m told is beautiful…but for now all I see are hills and snow. I guess at least, I’m hurrying around with pressing, but really boring to-dos (like going to the DMV and getting on new insurances) while the weather is awful. I’ll wait for spring, when I will hopefully have time to enjoy it! 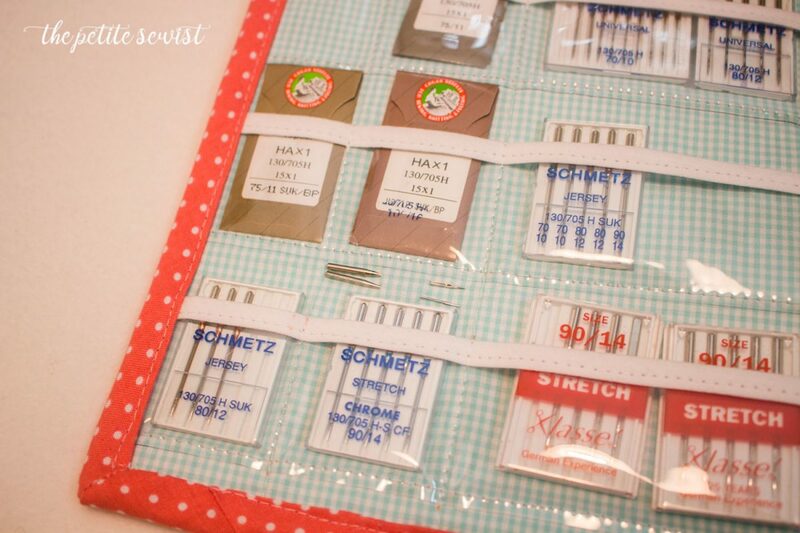 Today I am sharing with you a booklet to organize my sewing machine needles. I’ve been trying really hard to focus on the organization of my sewing room and this was one area that really needed some attention. I think it’s important to have the right needle for the right project. I have a lot of different types of needles for specific purposes and this organizer makes it easy to see exactly what I have. I like to purchase needles online because I don’t have to wait for a sale and it’s easier for me to find the specific needle I’m looking for. I got this most recent batch of Organ Needles and rotary blades (28mm and 45mm) from Simply by Ti. These products are not only a great value, Ti carries a wide selection of different types of needles so I know she has exactly what I am low on. She even has serger needles! The organizer has a strip of fleece inside to store hand sewing needles. 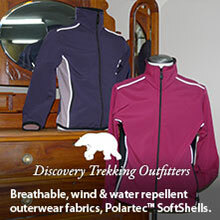 On the outside, you’ll find a zippered pocket to store all of my rotary blades. The outside back pocket has a sewing needle reference chart (google docs). Every sewing room needs one of these! 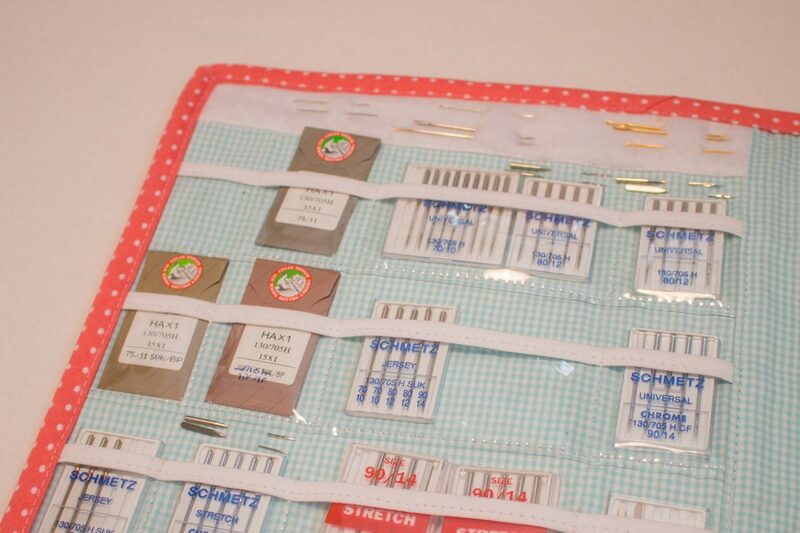 There are a couple of patterns online for making a sewing machine needle organizer. I wanted something a little different, so I chose instead to make my own. I began with some squares of quilters cotton backed with interfacing (9.5″ square). I decided I wanted my clear vinyl pockets to be 1 and 3/4 inch tall and as wide as the square. I used three strips of vinyl per page. 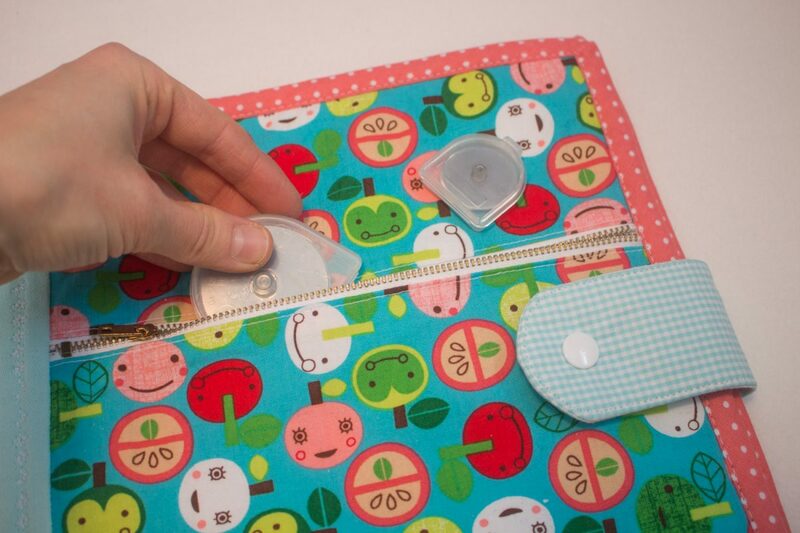 You want the strips to be far enough apart that you can pull your little needle packages out with ease. 2. 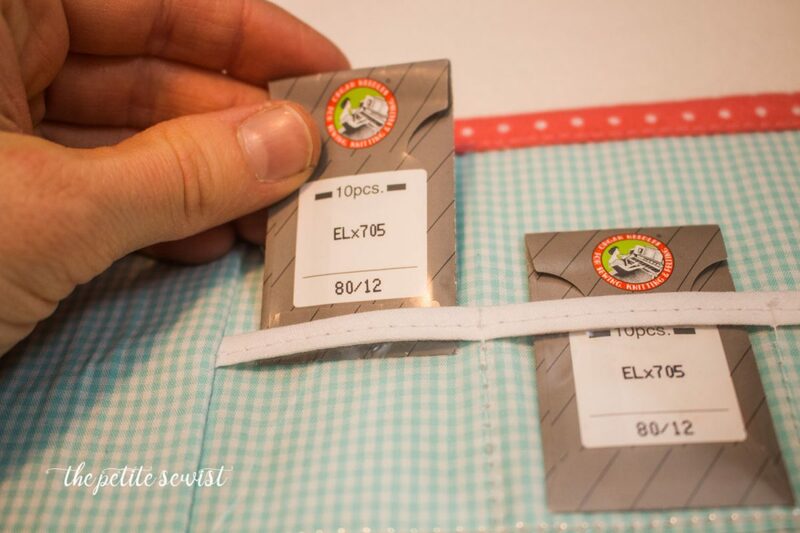 At my machine, I sewed the 1/4″ bias tape to one of the long edges of each of the vinyl strips. You will need a heavy duty needle. I used a denim/jeans needle. Even so, my sewing machine struggled a bit under the weight of the vinyl so I made sure to go extra slow and use longer stitch length than normal, 3.5 millimeters. 3. Then it was time to attach the pockets to the fabric. I sewed them one at a time using the placement I marked earlier. I sewed the bottom and the side edges. Then I decided how many little pockets I wanted. I have many different brands of sewing machine needles in my stash. Some of them have thick cases, and some of them, like the Organ Needles, are in a little paper envelope. I made some of the pockets narrow and some of them very wide. 4. I stitched vertically down the vinyl to create the pockets. Perhaps this goes without saying, but you cannot use pins on vinyl because it will poke a hole and damage the vinyl. If you need to, you can use Wonder clips. 5. 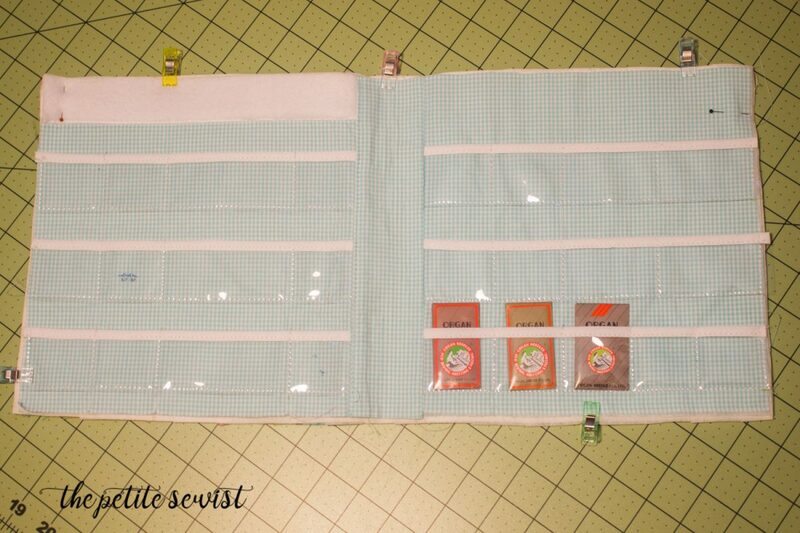 I stitched two pages of pockets together with a thin strip of interfaced fabric. 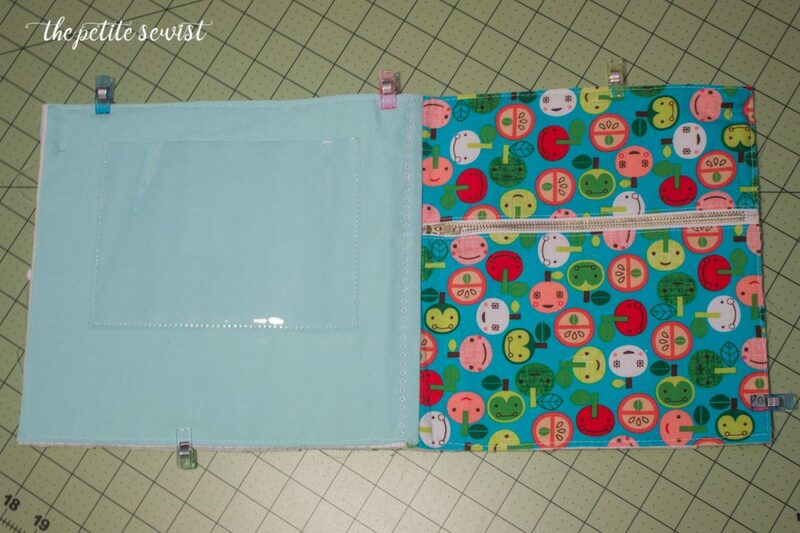 Then I created the cover using aqua twill for the back and a fun cotton apple print on the front. 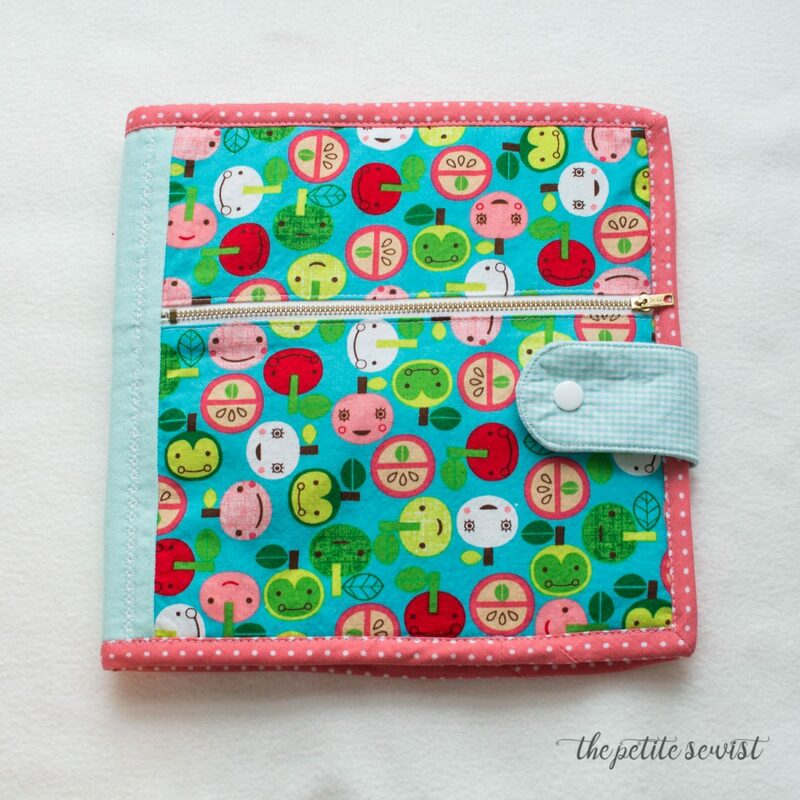 The zippered pocket is where I keep my extra rotary blades, in a little case of course. 6. Next I assembled the binder flap and attached it to the back cover. 7. I basted the cover and the inside to each other, wrong sides together with a thick layer of quilting interfacing sandwiched between. 8. Finally, I installed a Kam Snap on my flap and placed another one on the top cover below the zipper. I did reinforce the back of the fabric with a little square of interfacing and knit jersey. The back pocket has a nice and handy Sewing Machine Needle Reference Chart. Click the link to download this chart! 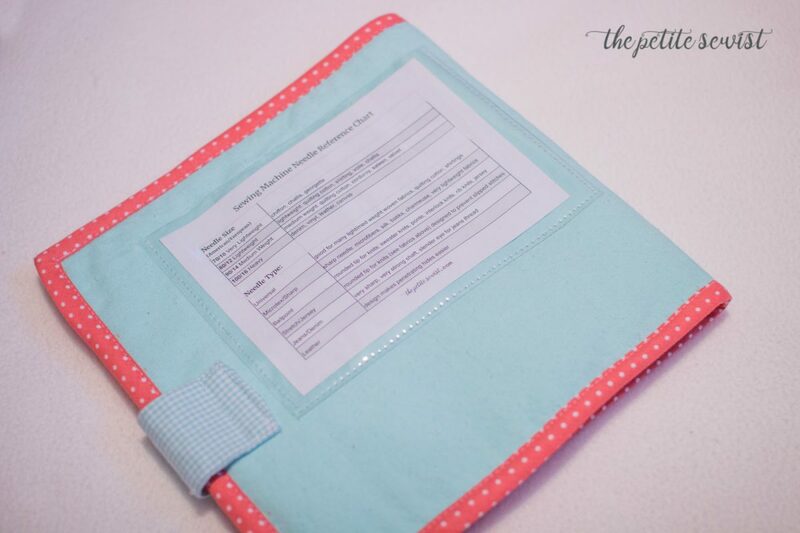 I hope that you will find a way of organizing your sewing notions that works for you! If there is something in this tutorial that isn’t clear to you, feel free to send me an email or DM me on Instagram @thepetitesewist. Many posts contain affiliate links. This means if you click and choose to purchase, I get a small commission. This goes right back into my sewing $ to create more content for you. Thanks for your support!